In this paper, we present a general methodological frame- work, called Wisdom (Web Based Information System Development with a cOmprehensive Methodology), for the development of Web-based information systems (WIS). Wisdom is generally applicable and supports the design and the development of a wide spectrum of WIS applicati- ons. This is achieved by defining the Wisdom framework as a family of inter-related activities. The most suitable combination of activities for the development of a target WIS application is obtained by dropping and/or specializing one or more of the component activities of Wisdom. This research has been partially supported by MURST, within the InterData project, and by CNR. A. Deutsch et al. XML-QL: A Query Language for XML-QL. 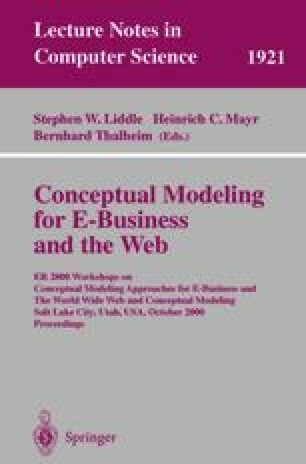 World Wide Web Consortium, Working paper, (http://www.w3.org/TR/NOTE-xml-ql), 1998.